0% Interest for 2 Years! OR Save 10% Now*! Hurry Offer Expires May 31st! Call Now to Learn More! Fill out this brief form to request your free inspection and estimate, then as a FREE BONUS, you can immediately download your Free Homeowner’s Guide to Foundation Repair, Basement Waterproofing & Crawl Space Moisture Management, all written by the Professional Engineers at JES! Having repaired over 70,000+ homes throughout Virginia, as well as DC, Maryland, and northeastern NC since 1993, we know what types of foundation problems exist in your area. And since JES is locally owned and operated by Professional Engineers, you can feel confident knowing that the foundation repair solutions we recommend take into account local considerations like your weather, soil, and geography. You don’t have to live with stressful foundation problems! 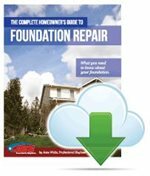 Learn how you can save yourself time and money by requesting a free professional foundation inspection and receive your FREE full-color “Homeowner’s Guide to Foundation Repair”, written by the Professional Engineers at JES. When you request your free inspection today, you will receive our full-color “Homeowner’s Guide to Foundation Repair”, written by the Professional Engineers here at JES! It includes everything you need to know about your home’s foundation, including what causes foundation problems, what problem signs to look for, and what to look for in a foundation repair contractor. Get your free guide today! Take the first step to a safe foundation and home by requesting your free, no obligation inspection (a $399 value) by a professional foundation repair expert at JES today! Our experts will evaluate your individual needs and propose a solution tailored to you, your home and your specific needs based upon the soil types, climate and other factors in the state of Virginia. And remember, we’re consultants…not salesmen! We’re here to help! From our experience, we know that often times foundation problems cause basement waterproofing or crawl space repair issues as well. That’s why JES offers proven solutions for all of these issues, giving you a complete menu of repair options for your entire home. Rather talk to a live person? Give us a call at (888) 572-7051!